A quick look is not uncommon. Things are often what they seem. Well–they are and they aren’t. 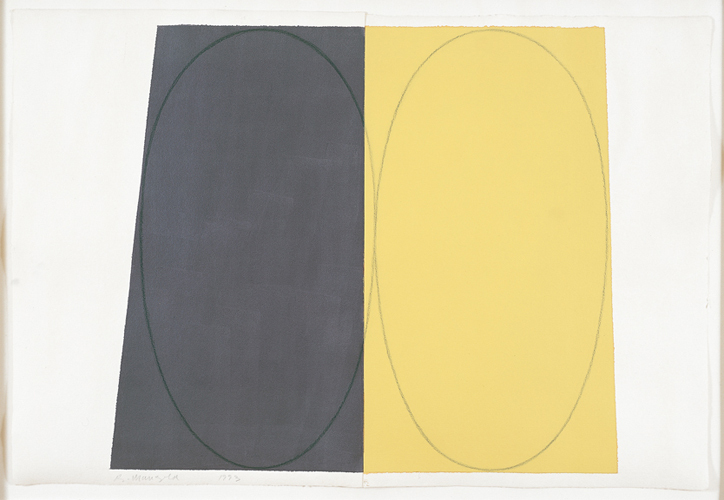 A little time is warranted to discover the pleasures of this work by Robert Mangold. Everything you need to know is right there in the artwork. Two abutted sheets of paper. Two hand-drawn pencil line ellipses. Dark and light values paired. A mix of dark purple/red/black. A wonderful green/yellow. Somehow, I feel like I know this color–yellow mixed with a few drops of black. It is my sense that Mangold’s color is developed incrementally, the result of subtle adjustments. The application of each thin layer of paint slightly differs from the previous layer. The color fields touch where the two sheets of heavyweight paper meet. The overall composition appears symmetrical. Top and bottom edges of the color fields are parallel. Sides are not. From a distance the color fields look hard-edged. Close inspection reveals paint bleed. The straight edges of the two color fields contrast with the soft curves of the two ellipses. One is in/on the light-colored area. The second materializes in the dark field of color. The artwork was made by alternating line and color. The result fixes a line that is neither on nor under the color, but rather one with it. The layering of line and color traps time. Mangold’s art is in the give and take, his intuitive sequencing of what will next happen. It is definitely not mechanical. There is much to see and consider. So many decisions are required to make this one artwork. Awareness of them commands my attention. The drawing rewards and confounds expectations. Intention is built on experience and intuition. These are qualities I strive to embrace in my own art making. This entry was posted in Mark Williams, Robert Mangold. Bookmark the permalink. Post a comment or leave a trackback: Trackback URL.